The new Iveco Powerstar 7800 has been specifically developed in Australia to withstand the country’s harsh climatic extremes and physical road conditions, says Marco Quaranta, product planning manager at Iveco Trucks Australia: “Our product engineers have worked hard to develop a unique product that blends an American driveline and European comfort into an Australian-made truck,” he said. Designed and built at the Iveco manufacturing base in Dandenong, Victoria, the Powerstar 7800 is the latest addition to the Powerstar range and the flagship of the Iveco fleet. The 7800 is a heavy duty workhorse, with a 140 tonne gross combination mass (GCM). Managing director of Robertson’s Transport Greg Robertson was the first person to take delivery of the new Powerstar 7800. 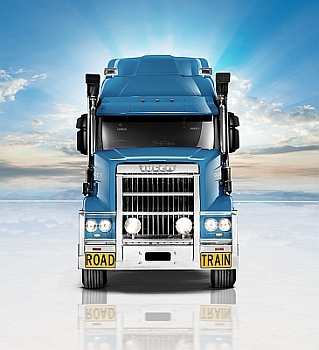 “We received the 7800 from Iveco in October 2012 to evaluate in our fleet of 18 road trains. 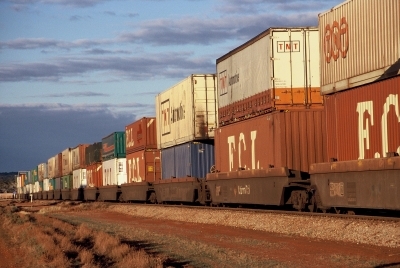 It has travelled around 250,000km since then, on all types of roads and back tracks throughout Western Australia, Northern Territory and Queensland, pulling B-doubles and two or three-trailer road trains grossing up to 130 tonnes,” Robertson said. Powered by the 15-litre, 600 hp engine, the Powerstar 7800 delivers 2,050 lb/ft of torque through its Eaton 18-speed Roadranger transmission. The operating temperature of the engine is controlled by a 12452cm2 (1930in2) radiator/cooling package. The engine also uses cooled exhaust gas recirculation (EGR) to comply with emissions regulations. Fuel for the massive engine is supplied from the four standard, 450-litre capacity, round aluminium fuel tanks. 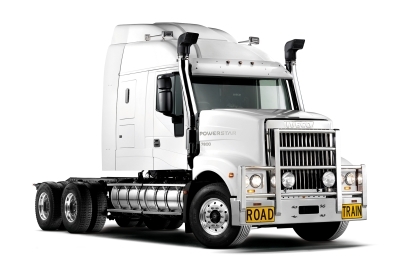 The engine and power train are mounted on a steel C-wrap chassis designed and built in the Iveco manufacturing facility in Dandenong, Victoria. The Powerstar 7800 cab gives increased visibility along with high levels of comfort and superior ergonomics, lessening the impact on the driver’s body. The sleeper cab is spacious, with plenty of locker space, and an inner spring mattress guaranteeing comfort. Custom options include an in-cab fridge, flat-screen TV with DVD player, and an ISRI ‘Big Boy’ air-suspended seat and ‘reach and tilt’ steering column.